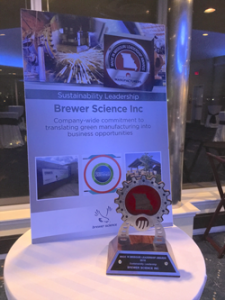 September 30, 2016 – St. Louis, MO – Brewer Science was honored by the Missouri Association of Manufacturers with a Made in Missouri Leadership Award (MMLA) for Sustainability Leadership. The award honors innovative Missouri manufacturers and leaders that are shaping the future of global manufacturing. Brewer Science received recognition for the development and implementation of a robust and strategic environmental program, which led to a program that was certified Zero Waste to Landfill The impact of this certification reinforces Brewer Science’s commitment to the environment, both internally and externally. For more information about Brewer Science and its technology, email @BrewerScience, like us on Facebook, and subscribe to our blog. Brewer Science is a global technology leader in developing and manufacturing innovative materials, processes, and equipment for the fabrication of semiconductors and microelectronic devices. With its headquarters in Rolla, Missouri, Brewer Science supports customers throughout the world with a service and distribution network in North America, Europe, and Asia. Brewer Science has earned the Zero Waste to Landfill certification from GreenCircle Certification LLC. We’re prepared for the next generation. Are you? Find out at http://www.brewerscience.com.